Join Easter Seals in our mission to provide exceptional services that offer hope, help and independence to people living with disabilities. Now you can create a personalized Web page and raise funds online on behalf of Easter Seals … and it's easy! Honor a friend or family member, or tell your own story. 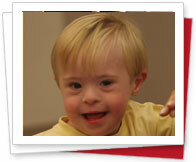 Use text and pictures to tell others why you support Easter Seals, and why they should, too! You can also support other Champions -- people just like you -- who have created Web pages to raise funds for Easter Seals. Create your Champion Web page -- Honor a friend or family member or tell your own story. Start fundraising now! Find a Fundraising Champion -- Find a friend or family member's personal fund raising page and donate online to support them. Manage your Champion Page -- Access all the tools you need to update your personal Web page, email your friends and family and track your fund raising performance. Frequently Asked Questions -- Read more details about the Easter Seals Champion Program and managing your Champion Fund.